BAY VILLAGE, OH – It was a beautiful day to head out into Lake Erie from Huntington Beach. I was happy to get some time fishing from the kayak and didn’t really care what I caught, I just wanted to catch fish. I set up one rod with a bottom bouncer and worm harness as I drifted and the other rod was for casting. I had a few moments of excitement when I had a strike on the tube jig I was throwing, but it was very short lived. The 3-4 strikes all came off shortly into the fight. Curious as to what it might have been, but I guess that’s fishing for you at times. My bottom bouncer rig remained quiet throughout the day, other than a single Sheephead, and a number of Round Gobies. 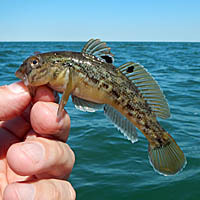 I’ve determined my next trip I will dropshot the gobies as bait themselves, I used to do this at the pier in Port Clinton with some success. The highlight of my day came when my rod I was casting was sitting in the rod holder. While I was busy removing a goby from the other line, I felt the kayak shake and saw something had clearly taken the Berkley Gulp! Minnow that was just drifting in the current. The rod was doubled over and the fish gave me one of the best fights I’ve had on the kayak to date. 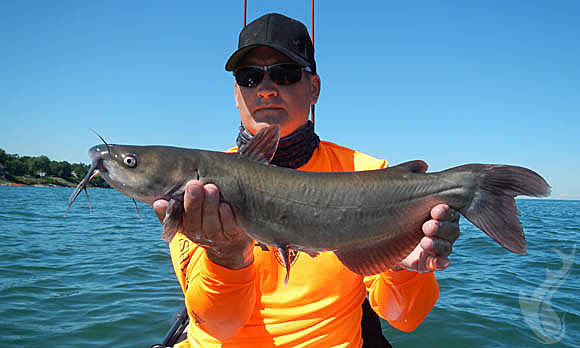 While I still am searching for my first Smallmouth Bass or Walleye from the kayak, I was plenty happy with the big Channel Catfish.